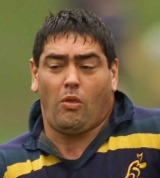 Born in Whangarei, New Zealand, Panoho made his Test bow in 1998 against the Springboks in Johannesburg. Despite his career in international rugby spanning both Australia's 1999 and 2003 World Cup campaigns he failed to make an appearance at the sport's global gathering, admitting after his retirement that his career highlight remained his 100% Super Rugby record against New South Wales. A year after his part in the Wallabies' maiden Tri-Nations success, he started at tight-head as the Wallabies lost the first Test against the 2001 British & Irish Lions. Following the end of his playing career he spent time coaching in Japan with Ricoh before taking up a post with Brisbane Premiership side Sunshine Coast Stingrays. He left the Stingrays in 2010 - handing the reins to former Wallaby team-mate Toutai Kefu.